Anas Al-Liby is one of the best examples of someone who sits in the uncomfortable but very real crossover ground between international terrorists and the intelligence and security services we're told are fighting a war against them. He's a modern day Luis Posada Carriles or Vincenzo Vinciguerra. Born in 1964, he came to prominence in the early 1990s as he traveled around Africa with notorious triple agent Ali Mohamed. They were scouting out possible targets for Mohamed's associate Osama Bin Laden, and according to Peter Lance's book this is when they took recon photos of the African embassies that were later bombed. Al-Liby then became involved with the LIFG, the Libyan Islamic Fighting Group. At that time they were essentially a domestic group focussed on getting rid of Gaddafi. Then came Al-Liby and the Secret Intelligence Service. According to hippy prophet and former MI5 officer David Shayler, it was around this time that an agent involved with the coup plotting against Gaddafi approached the British and wound up speaking to MI6. The British SIS then paid 100,000 to the LIFG to try to assassinate Gaddafi as part of the coup. This account is covered in detail in Spies, Lies and Whistleblowers, the book written by his partner Annie Machon. Sadly, Shayler has ruined any possibility of being taken seriously as a historical source due to his messianic indulgences of more recent years. Fortunately there is a fair amount of other evidence that what Shayler said was true. Firstly, the government charged him under the Official Secrets Act, so at least some of his claims must have been true. Secondly, they attempted to hold the trial in secret. Then they imposed an injunction on newspapers looking to publish articles by Shayler or based on information he provided, though this was spectacularly flouted by Mohamed Al-Fayed's Punch magazine. If there was nothing to Shayler's allegations then no harm could have been done to national security, so there would have been no need for the secrecy. Then there's the MI6 report, titled CX 95/53452, which shows that at the very least MI6 did have an agent codenamed Tunworth who was deeply involved in the coup plot, and that they knew who was plotting what ahead of time. While no smoking gun, the document is confirmation of some of the details, and was clearly leaked by someone from within the intelligence services. Then there's the assassination attempt itself, which took place in 1996, months after the date of the leaked document. The plotters placed a bomb in the road ahead of time, but blew it up under the wrong vehicle. Gaddafi escaped, but in the ensuing firefight bystanders were killed, along with members of the Libyan terrorist group and the state security services. In March 1998, Libya would be the first country to issue an arrest warrant against Osama Bin Laden, though this was 'buried' by the British and Americans. ...The Libyan al-Qaeda cell included Anas al-Liby, who remains on the US government's most wanted list with a reward of $25 million for his capture. He is wanted for his involvement in the African embassy bombings. Al-Liby was with bin Laden in Sudan before the al-Qaeda leader returned to Afghanistan in 1996. So what of Al-Liby these days? Well, rumour has it he fled to Afghanistan after the raid on his Manchester flat. He was reported captured in 2002, though whether this was in Egypt or Sudan isn't clear. Either way, it wasn't Al-Liby that they captured, as reported by the Wall Street Journal. Despite this, the BBC published a Who's Who in Al Qaeda a year later, in February 2003. This not only lists Al-Liby as captured, but as captured in Afghanistan. Further confusing things, these different reports state that he was captured in January, February or March, depending on which you read. Then, in March 2005 someone with a superficially similar name, Abu Faraj Al-Libbi, is arrested and detained by Pakistani police. The Times alleged that all the initial celebratory comments from the Americans came from their confusing this Al-Libbi with Anas Al-Liby. Initially, the Pakistani authorities said the man would be detained and not extradited to America, though they quickly changed their minds. 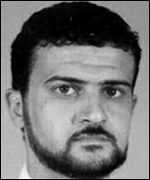 Despite all this, the FBI and US Department of State both still retain wanted posters for Al-Liby on their websites, indicting him for involvement in the African Embassy bombings of 1998 and offering up to $5 million for information leading to his capture. Further muddying the picture, Amnesty International list Al-Liby as one of at least 39 people "who are believed to have been held in secret sites run by the United States government overseas." Whether this is because he's a terrorist, or an intelligence agent, or both, or neither remains unclear. For further information on this complicity between Al Qaeda and Western intelligence services I recommend the work of Nafeez Ahmed, particularly his book The War on Truth, which he discusses in the following video.